Clayton just came to Canada last week from a high-kill shelter in California. We only had him for a day and he started throwing up and getting very ill. Today he went in for emergency surgery and had a foreign object removed from his stomach. It appears from the state of the object that it was part of a toy and had been in there for quite awhile (before he came to Canada). This surgery is very expensive (as all you dog owners know) but this rescue is totally non-profit and just exhausted their funds paying off a previous $1300 account at the vet. The vet would not do the surgery unless we paid $800 right away and we will likely still have another $1000 or more to pay on top of that. Ryan and I had to front this money as the rescue was not able to get the money today and the surgery needed to happen NOW. . Respect-A-Bull will be repaying us but they are a non-profit stretched to their limits already and funds only come in for them when someone makes a donation or pays to adopt one of their dogs. Please make sure you say on your cheque that it is for Clayton. Clayton is a sweet boy and does not deserve to die over lack of funds, which is why we have fronted the money for his surgery. Once he is adopted either by us or another family he will have pet insurance but rescues are not able to insure pets as they come and go through their homes so frequently. Please help if you are able to, and if not please send some healing vibes his way as he has made it through surgery but now has some complications and is facing a bit of a rough time in the next few weeks. Thank you from the bottom of our hearts, and from Clayton as well!!! UPDATE Sunday morning: from the vet - he made it through the night and is doing fairly well so far. We are not out of the woods for about 10 days though as we have to see if the sutures hold. We are hoping to have our boy back on Wednesday - he is going to the rescue for the next few days as he still needs injections and medical stuff that I don't know how to do. Thank you to everyone who has donated so far - we are on our way to being able to pay this bill but have quite a ways to go still... the surgery was estimated at $1500 and that doesn't include all the aftercare that is going on now which will be adding up. Also a huge thank-you to everyone who has cross posted. We will keep you all updated as we get updated! UPDATE Monday morning: from the rescue - Dave & Jo-ann are taking great care of Clayton at their place and making sure he gets his med injections through his IV. For the next few days Clayton will have to spend the day at the vet's office for supervision and tests and go back to Dave & Jo-ann's at night. The vet is giving him water for the first time today and if he does well then there is food starting tomorrow. If everything goes well we should be able to have him back at our place on Wednesday but it depends on how he does. We want to thank everyone again who has donated!!! We are almost halfway there guys! I really want to reiterate that even $5 or $10 helps. If all my Facebook friends each gave $5 to the rescue, they would have all the money they need to cover this. Please don't think that a small amount won't help - it does! Further update for Monday morning: the vet is doing more tests to determine why Clayton's blood is not clotting - he almost bled out and died during surgery and the vet wasn't able to do everything in the surgery she wanted to do because of this. More bloodwork and testing is being done right now at the vet's office to try to find the cause of this. Another round of thank-you's goes out to those who have donated this morning - we love you guys! UPDATE Monday evening: Clayton was at the vet's office all day and is not interested in taking any water. We are on a bit of shaky ground now as x-rays today revealed his intestines are twisting and getting bunched up in his chest. This is not good and the vet does not know why it is happening. Clayton has gone back to Dave & Jo-ann's for monitoring overnight - the vet is on call in case he goes downhill and needs emergency surgery again. So far the vet bill is around $1800 and Respect-A-Bull has received donations for about half the bill. If further tests are needed or he has to have surgery again the bill will rise dramatically. We want to thank everyone who has donated so far and if you haven't yet but are able to spare $5, $10, $20, any amount helps - the link to donate is located above in this Note. Thank you and please keep sending positive healthy vibes to Clayton, he needs them right now!! We are Really worried about Clayton,his Xray's showed his intestines are twisted or bunching up..The vet is on call for emergency surgery tonight worst case.We have only reached half way on his vet bills of $1800.00 after today. We still need at least $1000.00 more,if he has to have surgery again we will need $2000.00 Please and Thank you what ever you can spare $10-$20 can go a long way! Sheba is a fantastic lady who loves nothing more than to be a part of a family.Sheba is a dog who would thrive in a women's household, as she can be a bit nervous when meeting men. This is a truly smart and loving dog. Sheba sits and waits to be fed as well as to be leashed and unleashed. She would greatly benefit from some basic obedience classes as she does need some leash mannners. Sheba is great with dogs, kids (of any age) and cats. 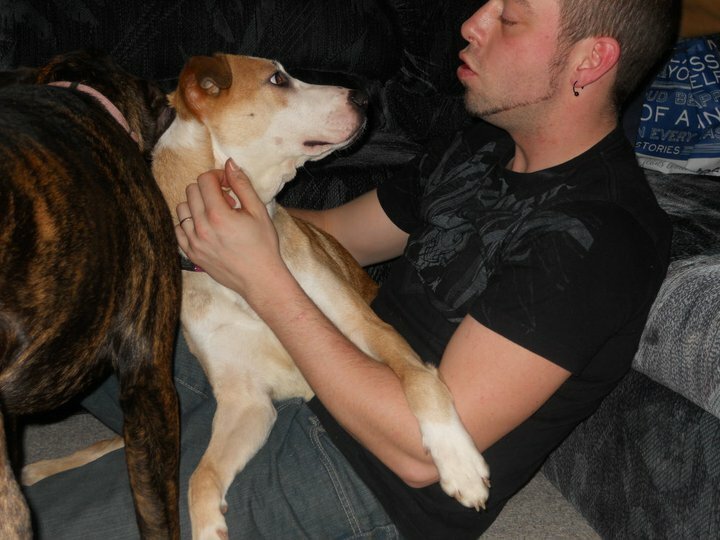 Sheba loves relaxing and hanging out with the family and is pretty low energy as long as she gets her daily walk. Sheba would be a great for a first time dog owner, she is quick and responsive to training and is willing to please. Adopting is a rewarding experience and Sheba would be a great place to start. Every dog deserves a loving and caring home. If dog is man's best friend then we should try and be theirs. After only a week as a new foster home for Respect-A-Bull I have a new found respect for all animal rescue organizations nationwide. Opening up your heart and your home to give a dog a safe and loving environment, where he might not have had one before, is more rewarding than you can imagine. Watching them explore their new surroundings is as exciting as watching a child grow. Swivel is a very nice boy, who had a rough start to life as most of the rescue dogs have, although this does not alter his sweet personality. He is smart, friendly and energetic he plays with our 3 year old daughter as well as our own dog and we have had many laughs watching their doggy antics. Swivel loves walks to the beach (always with nose pressed to the ground) where he can play in the waves. Already his personality has landed him (hopefully) his forever home where he can be safe and loved as any dog deserves. If dog is man's best friend then we should try to be theirs. Well what a great day,Respect-a-bulls welcomed the Port Alberni SPCA to our house for an inspection of the farm/rescue animals and we Passed! There was a report called in on us to SPCA head office for no shelter for our horses,goats,chickens,ducks! It also said we had 14 dogs locked in crates in our house! So anyone reading this that has heard the Hear Say about us and did not just ASK us,Shame on you! 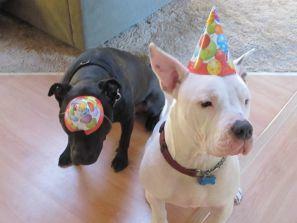 For over 5 yrs Jo-Ann and I have helped save 130 Pit Bulls in need! We did not do this our selves,we had support of a great team of people! Over the 5 yrs we have made a lot of friends,we would like to thank thoughts friend for standing by us and that just Asked ! We have also made enemy's, those enemy's we wish them no harm and the best! But we are people and some times people just don't get a long,doesn't make them or us bad people! We know that in the last few months there has been lots said to discredit us and Respect-a-bulls ! Some people have just stopped talking us,some of those people meant lots to us! But you know i guess we did not mean the same to them! They decided to listen to Hear Say,instead of picking up the phone and just calling us to ASK! Well you know it's a shame the Caddy rescue world is this way,some people just love Hear Say! So we ask in future if anyone hears *Hear Say*,Just ask us or better yet come for a visit your self to see how we care for animals in need we have a open door! Please share this note so the people it is intend for can read it! We no longer have them on our Face book page so we do not have contact with them! But you do! 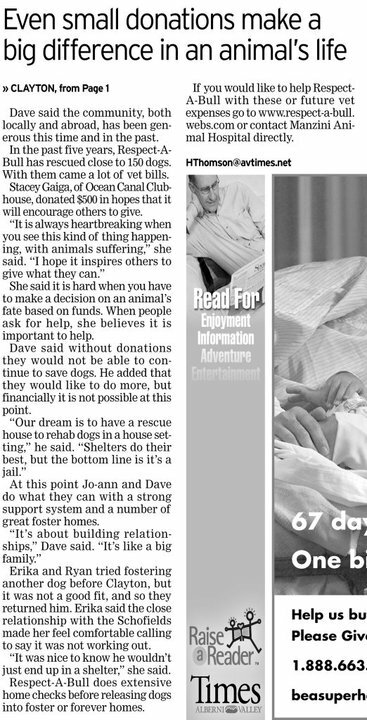 Respectfully Dave and Jo-Ann Schofield founders of Respect-a-bull dog rescue! The story of one pit bull terrier named Stanley inspires people all over the world to help shelter animals “one dog at a time.” Cathy Stanley, of Camp Cocker Rescue, often walks through the local Los Angeles animal shelters with her video camera. She shoots video of all the adoptable dogs to post online, in hopes that someone might be inspired to help just one of the animals they see in the video. 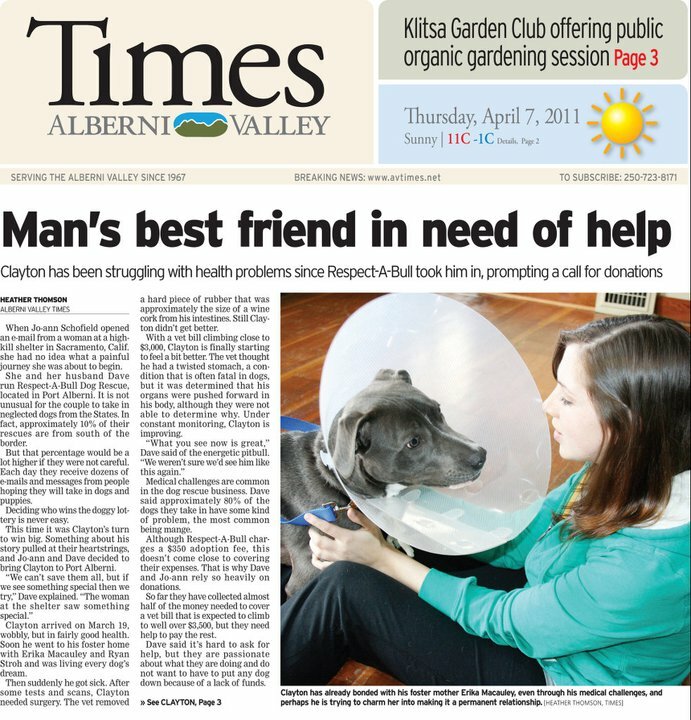 From left to right: Taylor, Josh Caufield, Jo-Ann Schofield, Dave Schofield, Teresa Caufield and Stanley pose for the Alberni Valley Times while out for a walk in November 2010. Stanley was doing just that in late 2009. That is when she first saw a sad pit bull terrier with scabs all over his body, half-closed eyes and raw red skin due to demodectic mange. “I saw him and I gasped and put the camera down,” said Stanley. Though Camp Cocker is traditionally a cocker spaniel rescue, Stanley wanted to help the pit bull terrier. “I do desire to save all breeds of dogs it became clear to me early on in rescue that if I didn't narrow my focus and just work on one specific breed of dog, that it all would become too overwhelming for me to walk into a shelter and try to decide,” said Stanley. Still, Stanley knew she could not overlook this dog in desperate need of help. When she returned home, she made a short video about the dog (who had yet to be named) and started e-mailing everyone she knew. Soon, e-mails poured in and people from all over offered to donate money toward helping this dog. It was not long before rescuers started attaching Cathy’s last name (Stanley) to the dog, “then it just sort of, stuck,” according to Stanley. Stanley and his adoptive brother, Taylor snuggle up with Teresa Caufield. The video focused on the idea that it takes just one person to do one thing for one dog. Stanley began advocating the idea of “Just One Dog” because many people came to her, wanting to help these animals, but felt overwhelmed. “After they understood the message of just one dog, they realized they didn't have to do it all, they didn't have to save every dog in a shelter, they only had to do one small part of it, one thing,” said Stanley. Stanley’s “Just One Dog” video made its way around the world and offers to take the dog came in from all over – but Stanley was looking for something specific. Camp Cocker wanted “a rescue who only had the highest re-homing standards, was selective about whom would be qualified to adopt a pit bull, did home checks and follow ups,” according to Stanley the pit bull terrier’s recent follow-up video. On Christmas Day 2009, Stanley’s video made its way to the inbox of Dave Schofield of Respect-A-Bull, a foster-based pit bull terrier rescue in British Columbia, Canada. Stanley and Taylor celebrate Stanley's first Canadian birthday. “[The video] touched me, in a way. Seeing it on Christmas day and reflecting on family and what Christmas means – we wanted to give something back,” said Schofield. 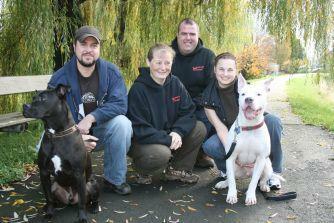 Schofield and his wife, Jo-Ann founded the rescue after learning about the harms of backyard breeding. As former backyard breeders, the Schofields were shocked when they discovered the truth about backyard breeding. Schofield called Stanley on Christmas day and offered to take Stanley. Soon Camp Cocker raised enough money to have Stanley flown to Port Alberni, British Columbia, where Respect-A-Bull was waiting with open arms. Stanley was placed in a loving foster home while his skin healed, but soon it was discovered that Stanley would need surgery to repair the entropion that afflicted his eyes. 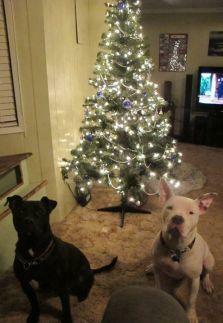 One year later, Stanley celebrates Christmas with his forever family. Respect-A-Bull raised the money, and Stanley had his surgery. 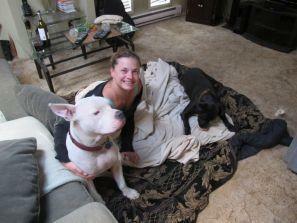 Respect-A-Bull was contacted by many people who had seen the “Just One Dog” video and wanted to adopt Stanley. In the end, Josh and Teresa Caufield, who had not seen the video, but wanted Stanley because he was “a big, goofy, happy-go-lucky dog,” adopted Stanley, according to Schofield. It was not until after they adopted Stanley, that the Caufields learned how many people Stanley touched with his story. Since rescuing Stanley, Camp Cocker continues to work with Respect-A-Bull to help save and find happy homes for pit bull terriers just like Stanley. “It only takes one person to do one thing for just one dog,” said Stanley. “Animal rescue does not end with getting a dog out of a shelter, but actually that is where it begins. Camp Cocker and Respect-A-Bull rescues are always looking for volunteers, animal foster homes and donations. Learn more about Camp Cocker and Respect-A-Bull. Find an adoptable animal near you on Petfinder.com. 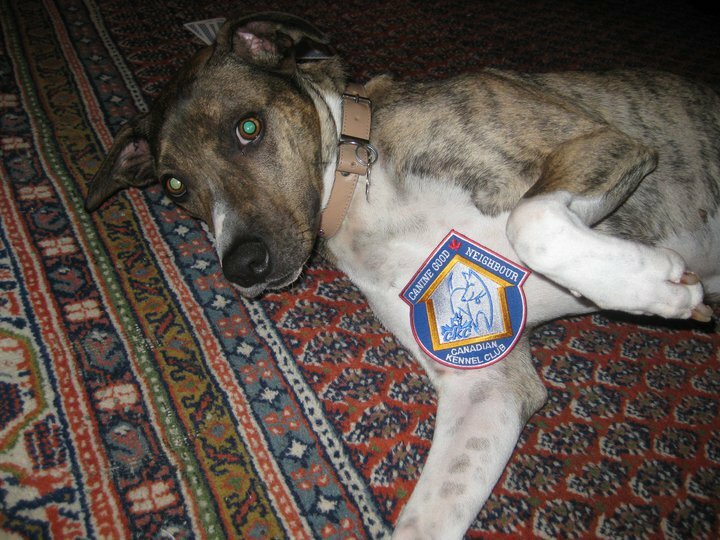 Watch Stanley’s original “Just One Dog” video. Watch the continuation of Stanley's “Just One Dog” video, one year later. Best Friends Animal Society is working throughout the country to help pit bull terriers, who are battling everything from a media-driven bad reputation to ineffective and expensive legislation. 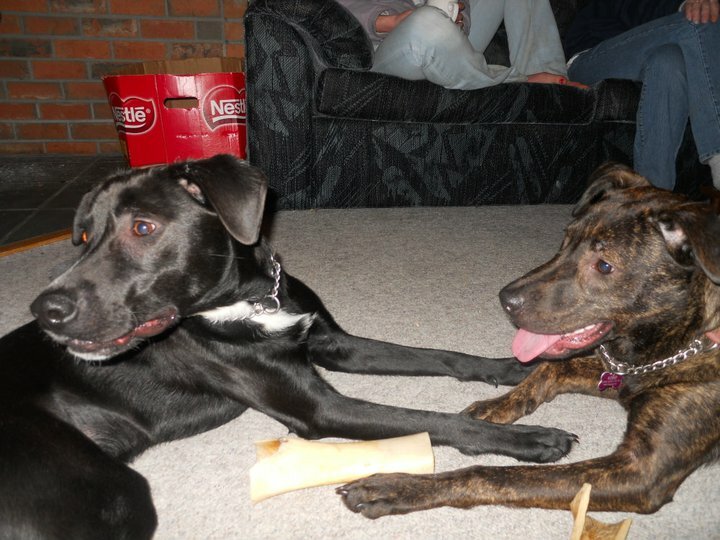 Best Friends hopes to end discrimination against all dogs. Dogs are individuals and should be treated as individuals. Find out how you can help by visiting and becoming a fan of the Pit Bulls: Saving America's Dog campaign. Join Voices for No More Homeless Pets for updates on animal issues important to you! Learn more about breed bans and dog bite facts at the National Canine Research Council. Find more resources in our Tools To Use section. "How to Prevent Breed Discrimination in Your Community"
Stanley And Taylor came for a visit! Respect-a-bull's go for a walk on the Dyke and visit AV Times Heather Thomson with Stanley and Taylor . On Sunday Nov 7th in Port Alberni Respect-a-bull's started a walk on the Dyke with some like minded dog people. We had a very busy day. 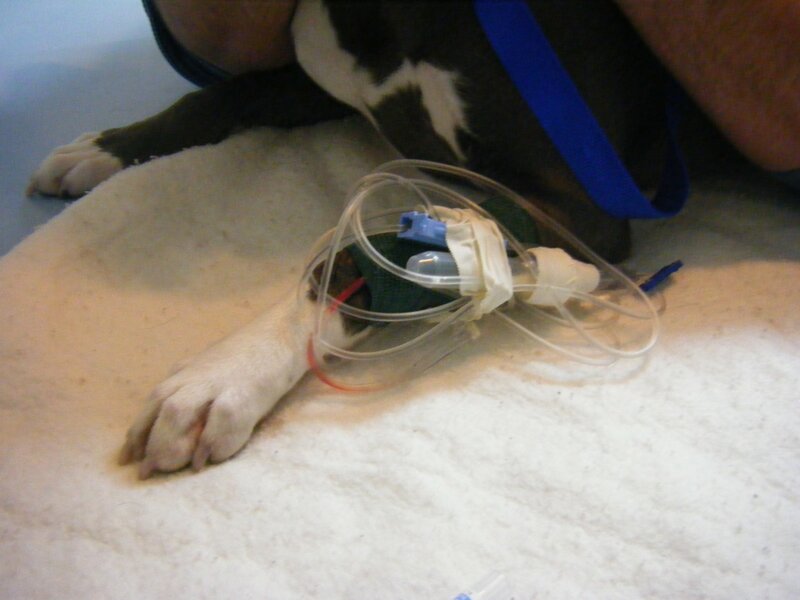 It started out with intravenous of saline solution, followed by injections of Human Grade Antibiotic for our old girl. She has Ecoli in her bladder. Bricklee is one of the first dog's Respect-a-bull's ever pulled from the SPCA. Then we had a couple of really cool dogs to see, Stanley and Taylor! They came down with their Mom and Dad, Josh and Teresa Caulfield, for a interview with the AV Times, to do a follow up story to the one they ran almost a year ago! We first headed over to a great cabin that they were staying at for the night and we were greeted at the door by two very happy dogs to see us. We have to say, when your in rescue we hear a lot of the really bad stories like Stanley and Taylor,so to show up and see these two dogs so happy to see us made our day! This is why we do rescue. To come Full Circle and see dogs that were going to be put to sleep or were really sick before they came into Respect-a-bull's care. Seeing this brings a lot of joy to all the sad stories we hear day to day. So after wet and warm responses from Stanley and Taylor we were able to say hi to Josh and Teresa. We headed out to meet Heather Thomson from the Av Times paper. This is where Betty Lou, Stanley,and Taylor get to meet again! Betty Lou felt like a Queen with two hot pitties wanting to greet her. Betty Lou even wanted to play with Taylor. She tried to play bow and put her paw on him. One of the things Heather asked Josh and Teresa is how do you feel about how famous Stan the Man is. Josh said it was not until 2 month ago I watched his video for the first time,so to me Stanley is just this cool dog living with us. Now hearing this at first from Josh surprised me, I thought for sure he'd seen the video! But the day after, now I feel like Josh...... Stanley is Just One Dog! As I write this one thing that comes to mind is Jingle Dog. You may be saying what are you talking about?? Well in Stanley's first Video there was a dog with a Xmas collar on. We nick named him or her Jingle Dog. We asked Camp Cocker Cathy Stanley, can you pull Jingle Dog as well? Cathy went and sadly every dog that was in the video but Stanley was put to sleep! So now you may understand why Stanley is Just a Dog. Granted a very lucky dog! To all the people that worked so hard to help a mange dog that no one wanted! THANK YOU, Jo-Ann and I can not do what we do without the help from people like you! After the meeting with Heather we headed to the Dyke to meet everyone for a walk. Wow ! When we got there about 12 people and 8-10 dogs were waiting for us! The weather was great until half way through our walk, when it started to pour rain but it did not matter. Because I believe it was Emma and Shane Eben's Mom and Dad that said LOOK UP, well we had a rainbow from one side of the Dyke to the other. What a site to see on our first walk on the Dyke! Sadly after about a hour we were done and had to say good bye to everyone. But the good news is every Sunday at 1 at the Legion parking lot we are going to meet up again. All breeds of dogs are welcome, not just Pit Bulls. 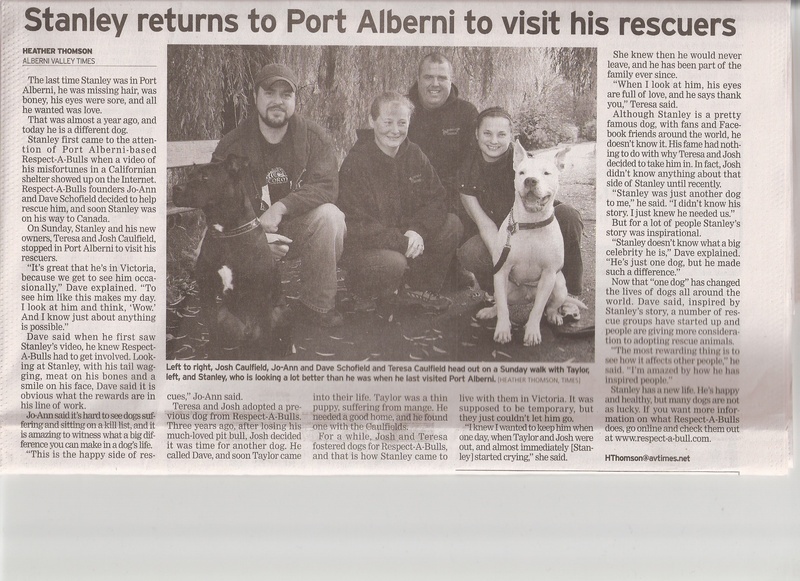 This is a great way for the public to see Pittie's with great owners, out with their dogs. So in closing Respect-a-bulls has done a lot of work helping Pit Bulls in need in the last 5 years,but we can not do it without people wanting to help us. Jo-Ann and I may be the faces of Respect-a-bull, but there are so many people that have helped us! For this we would like everyone to know Respect-a-bull is a team of people that care! Jo-Ann and I would like to thank you for your on going support! See ya at the Dyke some Sunday at 1 the more the merrier! Congratulations to Buster (the newest Respect-A-Bull) and Callie (was 'Smartie') for passing the CGN test today in Port Alberni!